I spent the 2011-12 year in rural Uttarakhand, India. Uttarakhand is a Himalayan state that boarders the Tibetan Plateau and Nepal. Uttarakhand has one of the highest maternal mortality rates in India, but very little research has been done to evaluate health care resources there. I interviewed women in Chamoli District regarding their health care utilization and knowledge of traditional medicine. During my time there, I lived with a family who all spoke Hindi, except for one daughter. I had to store ice-cold water in buckets for cleaning and drinking, and I had to sleep in single digit Fahrenheit weather without heat. 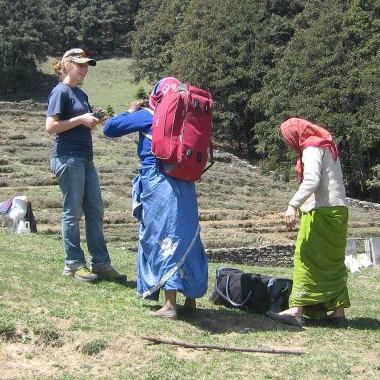 I lived the way that people in rural Uttarakhand lived and that perspective was invaluable to understanding the experiences that women shared with me about their pregnancies and deliveries. I am now at the University of Michigan Medical School. I have continued to be active in women’s health and global health research. I hope to publish the findings from my work in India over this summer. The Fulbright gave me the opportunity to truly understand health disparities. We are taught about disparities all the time in medical school and many students want to participate in global health. I feel that I had a unique opportunity to learn how to be a partner in health research. I know that the focus of any research project should be the people on the ground. I worked hard and learned a lot, but I was able to be completely open to new experiences and the information that I received. I do not believe that any similar opportunity will so significantly shaped my understanding of health and human interactions after I complete medical school. During my time in Uttarakhand, I was a blank slate. Most importantly, I saw that there are strong similarities between health care issues in rural India and in the United States. I feel that I now approach health disparities with a more creative mind after being exposed to both the people whom health care affects and the health care systems in two countries with seemingly disparate problems. I will always have my love of women’s health and India for my entire life, and I hope that other students will have the chance to push themselves to new limits and grow exponentially as a result.